SANTA MONICA, CA, USA: 2019 sees trailblazing pro audio manufacturer Antelope Audio firing on all cylinders with the worldwide premiere of three one-of-a-kind, industry-leading products — Edge Go, the world’s first bus-powered modeling microphone (enabling a complete studio experience with circuit-level mic and gear emulations onboard Antelope Audio’s real-time FPGA FX platform), alongside the cutting-edge Orion32+ | Gen 3 and Orion32 HD | Gen 3 flagship audio interfaces (offering unparalleled connectivity and unmatched conversion quality at expectations-defying prices) — at the 2019 NAMM Show in Southern California, January 24-27. Professional engineers tend to dismiss USB microphones as cheap, unimpressive products for beginners — and in many cases, they have a point. But what if it was possible to have the full, non-compromised fidelity of the Edge Duo multi-pattern large-diaphragm condenser mic (powered by a console-grade mic preamp, high- end AD converter, and signature Antelope Audio FPGA FX processing) packed into a premium bus-powered mic? Meet the Edge Family of modeling microphones’s newest member! Edge Go is so much more than just another USB microphone —- it’s a complete recording studio experience housed in a mic! Connected via USB-C and equipped with a 3.5mm headphone jack for real-time monitoring, Edge Go achieves an entire processed vocal chain at the hardware level — and all in real-time. With a variety of high-end condenser mic models and a special selection of lifelike vintage compressor and EQ effects, plus built-in de-essing, gating/expansion, tape saturation, and reverb all controlled by an intuitive PC/Mac app, getting fully-finished recordings on the go has never been simpler. Saying that, a collection of channel strip presets, crafted by industry pros, makes it even easier to quickly achieve a sound that’s ready for radio, podcast, Twitch stream, or album. And it all comes straight off the Edge Go, with practically imperceptible latency. The Orion32+ | Gen 3 brings the same incredible connectivity, flexibility, and channel counts to the production table that the original Orion32+ made its notable name with. But there’s even more to it now — elevated operating levels (+24dBu max), upgraded AD/DA conversion, ultra-fast and stable custom Thunderbolt™ driver for Windows, and a major facelift. Just like its predecessor, the Orion32+ | Gen 3 stands ready to take over studios and live shows internationally. 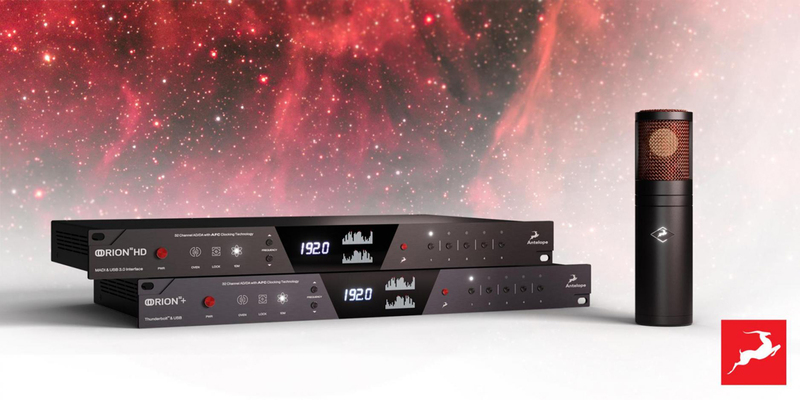 It will be available at an even more accessible starting price with a selection of real-time, FPGA-powered effects from the astronomical Antelope Audio collection. The original Orion32 HD set a new price/performance standard for HDX-compatible I/O. Industry-leading conversion and exceptional connectivity for the price ensure expectations are redefined once again with the Orion32 HD | Gen 3. Indeed, it includes all the power of the original, now upgraded with Antelope Audio’s flagshiplevel AD/DA conversion. In fact, its MONITOR output pair has been measured at a phenomenal 136dB dynamic range — an industry-leading specification! With cutting-edge conversion, a refreshed design, and a wide range of real-time, FPGA-powered effects, the Orion32 HD | Gen 3 will make productions and live shows shine like nothing else on the market when it starts shipping. Edge Go, Orion32+ | Gen 3, and Orion32 HD | Gen 3 are all expected to start shipping in Q1 2019 with estimated retail prices of $1,595.00 USD, $2,595.00 USD, and $3,995.00 USD, respectively. Note that the Edge Go package includes the modeling microphone itself, a rock-solid desktop mic stand, a pro-grade pop filter, an amazing custom shock mount, a USB-C cable, and a hard shell carrying case — everything needed to begin recording anywhere, immediately.